Jimmy Choo eat your heart out…Our story about the edible Mother’s Day slipper – yours for £700 – has secured more national coverage, it emerged this morning. The Daily Record covered the full story about the ultimate Mum’s Day treat on its website. 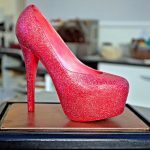 It reveals how family-fun firm Saffire Handmade Chocolate combined “two of many women’s favourite things, shoes and chocolate” to make the life-size ‘Saffire Slipper’. Handcrafted with Belgian chocolate, the heels are completely edible and modelled on designer stilettos such as Jimmy Choo and Christian Louboutin. But they also have a price tag to match – at £700 per shoe, you could pick up a pair of the actual designer heels for less.